Hooray for the arrival of summer! Bring on those balmy days by the water and lots of sunshine. As well as having all my picnic gear and giant swan floatie ready I’ve also been working away on my very first season capsule wardrobe for summer. I think summer has to be my favourite season for dressing. I love the shorts, dresses and skirts and the colour and pattern. If you are new around here and want a little intro on capsule wardrobes before you dive into this post you can check out my capsule wardrobe 101 series here. This is the fourth seasonal capsule wardrobe – so I have now created a whole years worth of capsule wardrobes. Each time I create and wear a new capsule wardrobe I feel like I am getting better and better at selecting which pieces will work best, but more importantly which pieces I will love and wear. For this capsule I decided to add in a little more colour, and take out most of my dark/black pieces. I’m slowly learning that I tend to gravitate more towards white, light and pastel colours over black, grey and navy. Coming into summer I think this is especially important as we generally prefer to dress a bit brighter in the warmer months anyway. I based my palette of whites, pinks, berry tones, lavenders and baby blues on pieces I already had and wanted to include in this capsule. Then I filled in the gaps with new items that fit into this palette and worked well with existing items. In my creating a capsule wardrobe post series I give guidelines around 30, 40 and 50 piece wardrobes. For this seasons’ capsule my total count came to 45 pieces – my biggest capsule yet. I am definitely still learning and experimenting with the number of items so I will be interested to see how I go with this many. Below I’ve listed a breakdown of my 45 pieces and whether they are old existing pieces or new to give you a little insight into my process and decisions. Basic Tank – Project Social Tee (existing – similar here): A versatile white tank is essential in any wardrobe. A perfect pair with any shorts or skirts. Silk Cami – Cami NYC (existing): A detailed cami is perfect for dressing up jeans or a skirt, and for layering under a jacket or cardi. Detailed Cami – J.Crew (existing – similar here or here): A pretty cami with eyelet lace and ribbon details in one of my feature colours – lavender. Perfect to dress up denim. Basics – From left to right Madewell / Madewell / NA-KD (all new): I love a good tee – so comfy for working from home and super versatile because they pair perfectly with any of my bottoms. Detailed – From left to right Madewell / Madewell / Free People / Free People (existing and new): I love all of the pieces because they have fun unique details and/or a pop of colour! Basic Top – Madewell (existing): I think every wardrobe should have a basic white long sleeve top. I love wearing this one with midi skirts or underneath cardi’s for a simple but elegant look. Detailed Top – Wilt (existing): A slightly oversized long sleeve top with cute ruffle details, the perfect long sleeve for a casual look with a bit of detail. I love pairing this one tucked into denim. Linen Shirt – Uniqlo (existing): This is my all time favourite linen shirt (and its super affordable) and it has made an appearance in most of my capsule wardrobes so far. Perfect for sizing up and having room to move. It’s a perfect pair with most skirts and bottoms and sometimes I like to tie the bottom edges up for a little twist on my look. Sweaters – From left to right Free People / Urban Outfitters (existing): Two of my favourite sweaters from my spring capsule – one v-neck and one patterned. The v-neck is perfect for layering over tees and camis and the stripe adds some detail to a basic outfit. Cardis – From left to right Vila / Top Shop (existing and new): Two cardis in neutral shades so that they are versatile. One has a nice textured finish to add some detail and the other has a wrap around tie. Both perfect for chucking over the top of almost any outfit. Jackets – From left to right ASOS / Gina Tricot (existing): Two classic jackets. The first is an oversized girlfriend denim jacket. Perfect over dresses and skirts. The second is a fluffy teddy jacket, which goes well with dresses and jeans and also adds some nice texture. Overalls – Levis (new): As soon as I saw these overalls I had to have them. They are such a nice fit, not too tight, not too short – just right. They work really well with any cami, tee or top underneath them. Short Patterned Dress – Hello Molly (new): A cute, swing dress with a nice floral pattern and waist tie, this dress can easily be dressed up or down. Short Basic Dress – ASOS (new): A sweet, simple cotton dress with button down details – a silhouette that is very in this season. The light blue gives it a very summery feel and makes it great for during the day. I also love how affordable this piece is. Detailed Midi Dress – Bardot (new): I fell in love with gingham last year and I’m craving more this season. This dress has such a beautiful silhouette and the elasticated back makes it the perfect fit. I also adore the bow detail and little cut out at the waist. This dress also has pockets – my favourite feature on any dress or skirt! Basic Maxi Dress – Free People (new): With a really simple silhouette this dress is really easy to dress down for the day or up for the night. The skirt is perfectly flowy without touching the ground or getting in the way going up stairs. Detailed Maxi Dress – Oh Hello (new): This dress has a gorgeous backless design and it a little bit fancier so works well for events or night time. Detailed Short Skirt – Steele (new): I got my first ruffle skirt a few years ago and fell in love with it. Unfortunately the elastic got a bit weird in it so it was time for a new one. When I saw this cute little pink one it was love at first sight. What I love about ruffle skirts is that they dress up any basic tee or shirt, or make a cute evening outfit with a silk cami. They are also very flattering when they are high waisted. Patterned Midi Skirt – Esprit (existing): This midi skirt is from my summer wardrobe last year (before I started my capsules), and it’s such a classic fit and the perfect summer blue that I just had to include it in my summer capsule. It works perfectly with basic camis, tanks, tees and tops. Plain Midi Skirt – Free People (existing): A beautiful blush midi skirt, which I got for last seasons spring capsule. The fit is really flattering and it has pockets. I really wasn’t ready to say goodbye to this skirt yet so it’s made the transition over to my summer capsule. As it is lined it isn’t great for really hot days, but perfect for those cooler days or evenings. High Waisted Shorts – ASOS (new): The perfect cut, these high waisted linen shorts are my attempt at wearing less denim shorts this summer. I’ve always loved the look of this style on other people, but haven’t really ventured out of my comfort zone of denim shorts. So this summer I’ve decided to take the leap. I love these because they aren’t too tight and the crouch isn’t too high (nothing worse!). They are also a nice light linen fabric – perfect for hotter days. Detailed Casual Shorts – Free People (new): I found these babies on Pinterest and had to have them. Cute ruffle details, loose fit and an elasticated waist band – the perfect detailed yet casual piece. They are actually part of the Free People Intimates range, but I’d seen photos of them as part of regular outfits and that was enough to convince me. Super flowy and perfect for really hot days when denim is just too heavy. Basic Casual Shorts – Unknown brand (exisiting): I’ve had these shorts for a few years and they are just simple black shorts with a loose fit and lace trim. They are really great for days at home, running errands or at the beach. Light Denim Shorts – BP. (new): This summer I’ve decided to move on from my favourite One Teaspoon shorts, which I’ve had for years now. I wanted something a little more high waisted and little bit longer. Dark Denim Shorts – Free People (exisiting): These dark denim shorts have a cute frayed hem, which adds a bit more interest than plain denim shorts. This is especially good when they are paired with a basic top. White Jeans – One Teaspoon (existing): White denim was made for summer, and I love the cut off style of these skinny jeans. Casual Jeans – Forever New (existing): One of my favourite pairs of jeans, the ripped details are great for warmer months. Dress down items like silk camis and blouses or be perfectly casual by pairing with a tee. 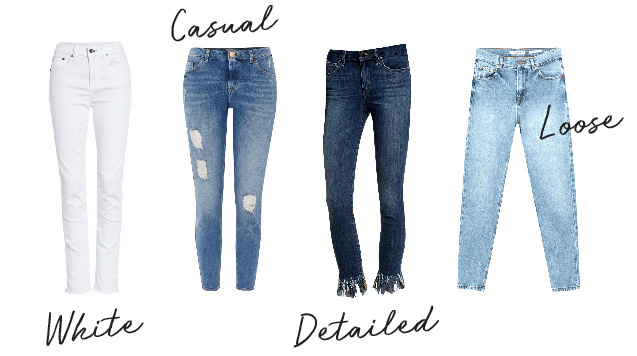 Detailed Jeans – Joe’s (existing): I love the very frayed bottoms on these jeans to add a bit more interest and detail than a regular skinny jean. Mom Jeans – Pull & Bear (existing): These mom jeans are a really flattering cut and the light blue gives them a really summery look (even though I had these babies in my winter and spring capsules – they are just a good all rounder). They can also be rolled up for a more casual look. Comfy Sandals – Teva (existing): My favourite comfy sandals from last season, perfect for the warmer days and also for the warmer destinations we will be traveling to during spring. Slides – Birkenstock (existing): As well as a pair of sandals I couldn’t help but include my favourite slides too – I’ve had these babies for over three years now! These are seriously comfy and go with almost any outfit! They can feel a little chunky if you’ve never worn Birkenstocks before, but after a couple of wears they’ll feel totally normal. Multi Strap Sandals – Madewell (new): I’ve had my eye on these sandals for quite a while – and when you can’t stop thinking about something for over six months it’s a pretty good sign that you’ll love them! A really simple but elegant sandal in the perfect nudey-tan. The buckles are elasticated so they are nice and easy to put on and take off. Sandals – Windsor Smith (existing): I’ve had these sandals for almost four years now and still love them. They are so simple but so elegant at the same time. They also have a super cushy sole which makes them oh so comfy and perfect for lots of walking. Espadrilles – Sole Society (new): I really love espadrilles and have had a few cheaper pairs in the past. But when I found these espadrille/sandal hybrid I was in love. The criss-cross detail and ankle strap make them a bit dressier – perfect to wear with skirts and dresses. As you can tell I don’t wear heels, and like my shoes pretty flat, so this is my kind of dressy shoe! Canvas Sneakers – Converse (existing): Another pair I’ve had for years, the classic white cons. Nice and light if you need closed in shoes on a warmer day. These versatile beauties basically go with anything. Leather Sneakers – Puma (existing): I added these sneakers to my last capsule wardrobe and they are super comfy. I love the ribbon detail to add a feminine touch, and that they are still basic enough to pull off with most outfits! Chelsea Boots – Sandler (existing, similar here): These ankle boots are a great neutral shade and pair really well with skirts and dresses. This capsule wardrobe has been put together for a northern hemisphere summer so is suitable for temperatures ranging from 15-35°C (60-95°F). Including a balanced mix of camis, short sleeved and long tops, skirts, dresses, shorts and pants, my summer capsule wardrobe has plenty of mix and match options to keep my looks fresh and fun throughout the season. We all have unique lives and styles so this capsule has been put together as an example. It also gives you some good insight into how many pieces you may want to include in each category. I work from home, travel quite a lot and have a casual style. This means that I choose comfy pieces that layer well without crinkling and are easy to pack. As an example, if you have an office job and/or dressier style you could swap long sleeve tops for blouses or button-up shirts, jeans for capris and sandals for heels. The base pieces for this capsule wardrobe are neutrals – white, blush, and black. I tend to make at least half of my wardrobe neutrals for two reasons. Firstly (and most importantly) because I really like wearing neutrals, and secondly because it makes mixing and matching different pieces so much easier. It’s also great to choose your staples in neutral colours so that they are more timeless and so you will get more wear out of them. I’ve chosen four accent colours for my spring capsule wardrobe – warm pinks and berries, and cool lavenders and baby blues. I’ve weaved these accents through with some basic pieces and some feature pieces. This is the very first season I’ve created a capsule wardrobe vlog, where I take you through my entire capsule and show you what each piece looks like on! Take a peek and let me know what you think. Subscribe on YouTube to make sure you see all my latest capsule and outfits videos throughout the season. * Sometimes I use affiliate links and feature products that were kindly gifted to me. However all opinions are 100% my own. I only ever recommend brands and things that I personally love!